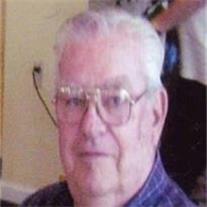 Raymond L. Lorenzen 83, passed away Jan. 3rd peacefully, following a short illness. Ray grew up in Blackwater, Virginia and moved to Kingsport, Tennessee in his teens and graduated from Dobyns Bennett High School in 1945. He served in the U.S. Army in Germany. He worked for Firestone Tire and Rubber for 40 yrs. He was an active member of the Church of Jesus Christ of Latter-day Saints. He was preceded in death by his father Fred P. Lorenzen and Mother Letha Livesay. He is survived by his wife of 63 years, Minnie Bass Lorenzen. Sons David and Todd, 5 grandchildren and 3 great-grandchildren, and brother Russell C Livesay of Georgia. Funeral Services are Saturday, Jan. 7th at the Kimball Stake Center 1266 S. 32nd St. Mesa Az. Burial will be at the City of Mesa Cemetery.